With improvements in NAND Flash memory technology, capacities are getting larger and larger. While in the past top-end memory modules were made in 2GB, capacities are now surpassing 16GB. Accordingly, mainstream capacities for SSDs have grown from 32GB to 256GB and beyond. Although drive capacity is increasing, P/E cycles (the key factor related to reliability) has decreased from 10K to 3K cycles as the industry moved from SLC to TLC to increase affordability. For industrial applications that require smaller capacities and higher reliability, only SLC products are truly recommended. But the costs associated with this configuration are too prohibitive for consumers. 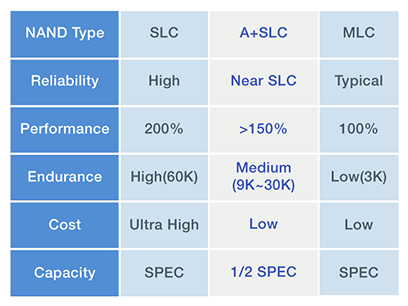 ADATA proprietary A+ SLC technology combines reliability and cost efficiency. 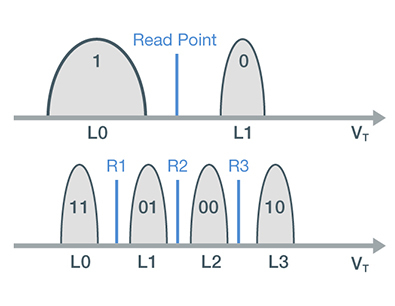 It uses custom NAND Flash firmware with an A+ sorting algorithm to emulate SLC performance on MLC Flash. A+SLC is highly reliable, provides excellent data integrity, and delivers a superb cost/performance balance.